As the snow melts, you might take a look at your vinyl patio or deck and sigh, thinking that it needs some work, that it’s looking a bit shabby. So what’s the best way to revitalize vinyl patios and decks? Tuff Industries has some ideas. One of the quickest way to revitalize old vinyl patios and decks is to recover them with a new vinyl membrane. Not only does this take only a day or so to complete, it’s also decently affordable. After the project is completed, you’ll have a brand new vinyl deck surface that will last you for up to 20 years. If your patio or deck is off the ground, it might be the railings that are holding you back from enjoying your outdoor space. New vinyl deck railings might take a bit more of an investment, but if you choose materials that complement your yard and your home you’ll find that it improves your vinyl patio overall. Drab, old patio furniture makes enjoying your deck much less…enjoyable. Imagine trading in your plastic patio chairs for a lovely, cushioned sectional. You can also take this opportunity to inject some color and personality into your vinyl patio. Like hanging new paintings and photos in your home, adding some odds and ends to vinyl patios can help it feel more like home. Consider plants, pots, hanging baskets, lights, cushions, and wall hangings (such as metal wall art) to bring some light to your patio. Sometimes the easiest thing to refresh a vinyl patio is to move things around. Unless you have an outdoor kitchen that includes plumbing, you should be able to try a few different configurations. Try setting up an entertainment area, separate from a barbeque or food preparation area. You can jazz up your entertainment zone with a throw rug, a coffee table, and a centerpiece, firepit, or water feature. Ensure that your chairs are taking advantage of the view and you’ll soon find that your vinyl patio is much easier to enjoy. 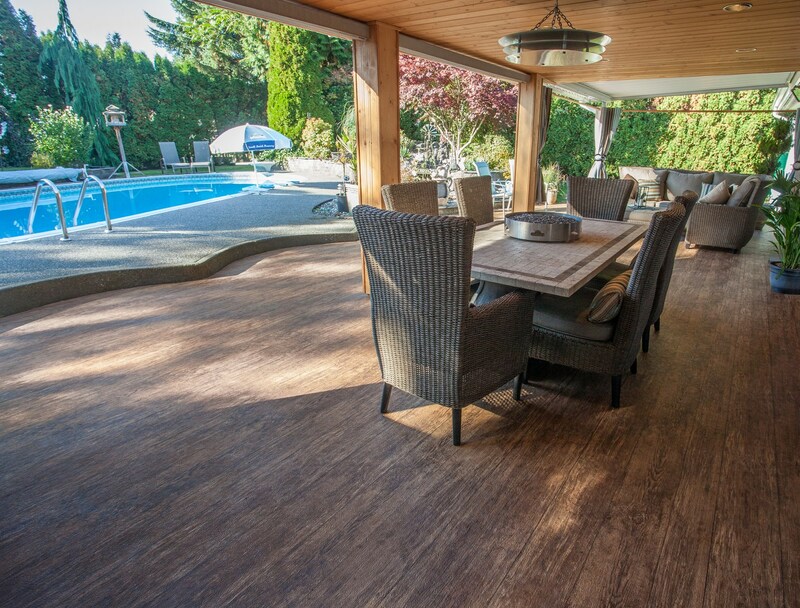 Are you ready to start off your 2016 with some of our ideas to makeover vinyl patios? Start by talking to a qualified vinyl patio contractor to get started, or check out our gallery of successful projects for inspiration.